We’ve spent just over two month in Garmisch-Partenkirchen, a small town in southern Germany, and have had such an amazing time. We weren’t quite sure what to expect as we had never been in this part of Germany before, but we were curious to find out, especially since everyone we spoke to during our travels in Germany were very opinionated about Garmisch and Bavaria – the region it is located in. One girl we met in Stuttgart said that there was too much forest for her liking, and a guy we met in Berlin broke into a big smile and started reminiscing about the huge pints of beer we would get. But whatever their thoughts on Bavaria were, they all agreed on one thing – Bavarian people are different from other Germans. Bavarian people are known to be very proud of their heritage, and tend to see themselves first and foremost as Bavarians, and secondly as Germans – something we noticed very often, but in a different way than we had expected. 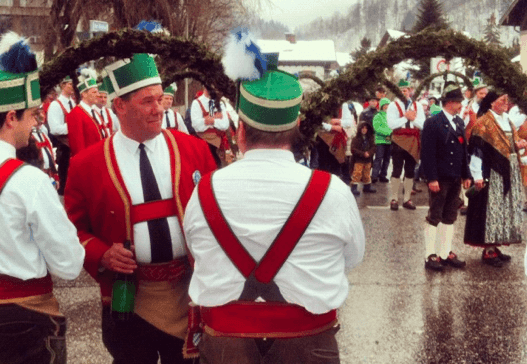 The people in Garmisch do talk about themselves as Bavarians, but always with a sparkle in the eye and never seem to take themselves very seriously at all. When something isn’t quite right, they joke and say that it’s ”Bavarian”; a Bavarian bill (one that is wrong or doesn’t make any sense), Bavarian time or Bavarian English are things we often hear from people here. Most people we’ve met are very friendly and many start random conversations with you on the street – this has made us more determined to improve our German so that we can actually hold a proper conversation. Our stay here in Garmisch has really made us realize how many opportunities you miss out on by not speaking the language well. There are small things with the language here that is different from the rest of Germany, and if you don’t know about them – you could accidentally rub people the wrong way. For example, it’s considered prim and distant to say ”Guten Tag” (Good day) – here instead most people say ”Grüß Got” (Greet God). In some sense, life here is a bit like living in a bubble, no matter what goes on in the rest of the world, little happens here, and many things remain the way they always have, especially traditions. Everywhere you go you will be sure to pass a man wearing the traditional Bavarian alpine hat on his head. It’s fascinating how such a small and flimsy hat can stay on someone’s head, and I’m surprised that they are so determined to wear them even though they can’t do much good in the winter weather, giving no warmth or protection from the sun – it just…sits there. Even in -16 degrees Celsius you’ll see men in their 60’s going for walks in their knee-high lederhosen and knee socks – pretty impressive..! I guess the life we live here in Garmisch is very different from most people who have a normal 9/5 job, just the ability to get up in the morning and be skiing down a mountain an hour later is a winter-lifestyle-heaven for us. It takes some time to get used to the slower pace, but for us it has been like taking a refreshing break from life. I absolutely love how you can walk into a dairy shop and buy fresh, unpasteurized milk that comes straight from their own farm in the back of the house. Garmisch-Partenkirchen (where we are living at the moment) is a very cozy and romantic little place in the German alps, and there are many things to do to keep you busy for the weekend. Just walking the streets is a romantic experience: traditional houses line the streets and are decorated with beautiful paintings on the walls. Another beautiful walk is through Partnach Gorge, a mile-long narrow path between high limestone cliffs with massive icicles dropping down to the river flowing below, creating bizarre ice formations. Skiing, or just getting up on the mountain for the incredible views is another fun experience. It’s easy and cheap to reach – the budget airline AirBerlin flies to Memmingen, from where you can catch a train to Garmisch-Partenkirchen with the Bavaria day pass (29 Euro for up to 5 ppl). 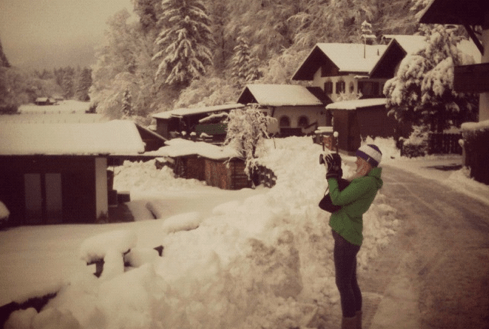 Earlier this year, we spent 3 months living in Garmisch-Partenkirchen, where we went skiing every single day. It was an amazing place and the perfect location to build up our new project. We know this is probably a strange time to be posting articles about winter, but in the scorching summer heat we think of this video as a nice, cool, refreshing drink! 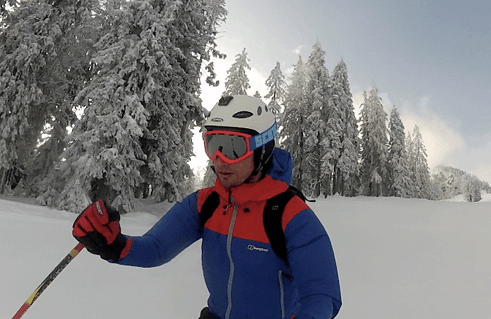 This was the first time we had used the GoPro video camera, and it turned out to be easy and really fun to film with. Check out the video below to view our impressions – enjoy! Our time here in southern Germany is coming to an end, and during the winter months we have grown to really love this little gem tucked away between the mountains. Here is a photo essay with photos taken from our iPhone and edited in Instagram, showcasing a few of our impressions from Garmisch-Partenkirchen and the surrounding alps – enjoy! The Bavarian Alps in southern Germany is truly a winter wonderland, with cozy villages, quaint houses and an abundance of white, glittering snow. With its claim to fame as “the top of Germany”, the Zugspitze mountain is the highest peak in Germany. To get there you have to take a cogwheel train through tunnels in the mountains, passing quaint villages, churches and fields along the way. We have really had all types of weather here, from snow storms with 2 meters of powder snow to ski in, to sunny days hitting well over 20 degrees Celsius. The people are very proud of their traditions, and many take every opportunity they can to dress in traditional clothes. The facades on the houses are beautifully painted sharing the history of the people who live in the homes and who own the shops, and cafes and restaurants serve mainly food famous for their region. Spring has really arrived by now, and people are enjoying the alps the way you do best – spring skiing, beer drinking, walking, beer drinking, biking, beer drinking, and so on. Twin alpine cities Garmisch and Partenkirchen promise outstanding getaways all year long. Germans and locals flock here to enjoy the breathtaking trails in the summer, but from November until May the area is given over to the celebration of snow. In fact, Garmisch-Partenkirchen has a fabulous reputation as a ski destination. The world’s attention was first focused on the villages and their surrounding mountains in 1936. Germany was hosting the Winter Olympics and alpine skiing was an event for the first time. The idyllic towns with their challenging mountain terrain even overshadowed the Nazi propaganda machine that was in full force. That regime didn’t last, but the charm of these two alpine towns certainly did. After the conclusion of hostilities in World War II, the focus in Garmisch-Partenkirchen returned firmly to skiing and welcoming visitors from around the world. The locale became the spot to see and be seen by the wealthiest Europeans and Americans. An overlay of elegance and sophistication remains today, with many well-heeled visitors still considering the spot as the place to make a splash. However, Garmisch-Partenkirchen is accessible to one and all. A visit today will mean hobnobbing not only with the well to do, but also with families who are enjoying their annual ski holiday. Somehow they all seem to fit in here. Garmisch and Partenkirchen were once two decidedly separate villages. Partenkirchen is by far the oldest with historians saying that it was once a Roman town called Partanum. The Roman road that ran through the center of town is still there, though it is called Ludwigsstrasse today. 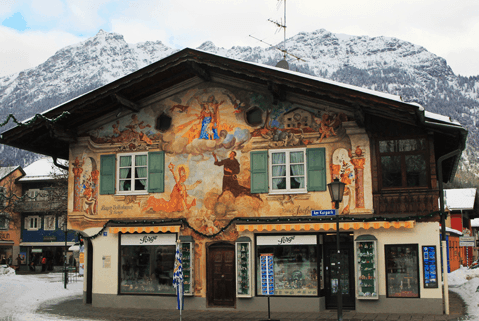 Of the two villages Partenkirchen is the best example of traditional alpine architecture. Many visitors prefer its quieter atmosphere and old world vibe. However, much to the frustration of Partenkirchen’s citizens, the name of their village is often forgotten. Many people refer to the combined community simply as Garmisch these days. Researchers believe that Garmisch was settled some 800 years after Partanum. Though that still gives it significant age, Garmisch is nonetheless the more modern village. It’s sleeker, more orderly and yet more likely to provide visitors with a raucous good time. When planning a trip to Garmisch-Partenkirchen it’s important to keep the individual personalities of the villages in mind. Both offer outstanding accommodations, but visitors must decide if they want a more traditional alpine experience or something with a bit more modern flair. With a structure that perfectly typifies the alpine chalet the Hotel Edelweiss is a favorite among visitors. Rooms are spacious and well-appointed, but it’s the staff that really shines. They dress in the traditional Bavarian style and never fail to be warm and helpful. The location of the Edelweiss is perfect, putting everything within easy walking distance. Another excellent choice is the Hotel Staudacherhof. Guests enjoy spectacular views from modern, spacious rooms. As at the Edelweiss, the staff is particularly notable for their welcoming attitude and eagerness to please. The spa area is especially lovely, boasting a sauna, steam room, indoor pool and champagne pool. This is a more modern property that features a sleeker look without sacrificing coziness. While the lodgings are fantastic, people really come here for the skiing. 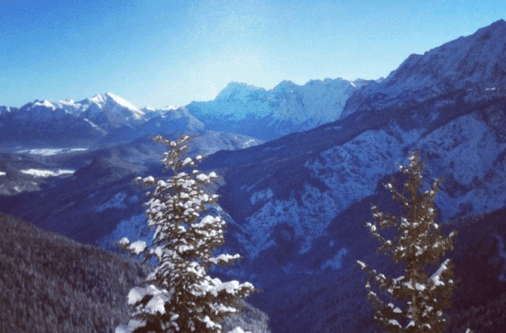 They are wise to do so because the region offers no fewer than three amazing peaks, and they are absolutely loaded with tantalizing ski runs. While the area offers plenty of hair raising challenges for the most seasoned skiers, it’s also easy to find runs suitable for the youngest or just the least experienced skier. The Kinderland area is an excellent place to start for those who are new to the sport. It’s essentially reserved for those who are just starting out, featuring easy runs and a fantastic ski school. The instructors at the school are some of the finest in the world. Very small class sizes that often have just three students per instructor ensure a solid foundation for even the most timid novice. One-on-one instruction is also available. By the time instruction is concluded, students are prepared to take on the region’s easier slopes. Garmisch-Partenkirchen actually boasts three mountains that are suitable for skiing. They are known as Kreuzeck, Hausberg and Alpspitze. Taken together travelers may hear them referred to as the Garmisch Classic ski resort. Some ski runs reach only 700 meters while others start at a dizzying 2,050 meters. With a total of 40 kilometers of ski runs, there’s definitely something for everyone here. Approximately 12 kilometers are considered easy while another 10 are classified as difficult. There are also about 18 kilometers of intermediate level runs. Access is gained to the runs via aerial tramways, gondolas, chairlifts, T-bar lifts or rope tow. The resort utilizes artificial snow making to ensure that all runs are always in peak condition during the season. While there are many easy runs, experienced skiers will want to try the Kandahar which is easily the area’s most challenging. World Cup events are held on this run, so it’s definitely only for seasoned enthusiasts. Of particular note is the “freie fall” section, recognizable thanks to its 92% incline. The slopes at Garmisch-Partenkirchen are known for being in exceptionally good condition. Skiers can expect well-groomed trails no matter how heavy the usage has been. The area also caters to snowboarders though it should be noted that there is no half-pipe. Also, night skiing is not currently available. With charming Garmisch-Partenkirchen still to explore most people don’t mind the absence of night skiing. Many of the hotels have bars and restaurants where patrons will almost certainly party into the wee hours of the morning. The tiny Schloderer Bierstuberl is much in demand by locals and tourists thanks to its authentic German fare and cozy atmosphere. It’s a casual spot that’s suitable for families. The owners are almost always at work on the scene and are willing to pass the time of day with customers. More contemporary dishes are offered at Vaun where the chef strives for something cutting edge yet also sustainable and delicious. It’s a more upscale atmosphere than Schloderer Bierstuberl, but still a comfortable place for a meal. The menu changes frequently so it’s definitely advisable to try Vaun on every visit. Garmisch-Partenkirchen also boasts the Spielbank Casino which is open daily. People who have bested the slopes during the day often try their luck here when the sun goes down. Even if they don’t strike it rich, the casino is a fun spot to spend an evening. With some of the best skiing in Europe, friendly locals and great dining and accommodations, Garmisch-Partenkirchen is the ideal spot for a winter vacation. I’m so glad you are enjoying GAP! I lived and worked there for a bit over a year, and still think of the town and people almost daily. Such a magical place! Enjoy your time there, it will stay with you forever. Tchuß! You’ve expressed very well why I love Bavaria so much! The people are so nice, friendly and helpful. I also love all the traditions. They feel so different than the traditions we have in the US. I’m glad you’re enjoying your time in Bavaria. I would love to live there for an extended period too. Spent brief time in Garmisch.Impressed with the view of Zugspitze.We stayed at the hotel Obermuhle under the towers alps. The hotel was full of old world charm and staff most obliging.We found the local bakery the owner was most helpful and friendly and provided us with the most delicious fresh bread rolls. We didn’t speak German were always met with a smile It was a charming friendly town with a magnificent view.